Ben Affleck has not talked much about playing the Dark Knight in 2016’s Batman v Superman: Dawn of Justice, which is unsurprising due to the expected secretive nature of DC’s films. But with his new film Gone Girl being released next month, he will surely be asked a number of questions during the press tour. And inevitably, The Sunday Times (via ComicBook.com) spoke with Affleck about portraying Batman. When asked why he decided to accept the offer to join Batman v Superman, Affleck said, “To get the exposure to a movie of this scale is an education.” While the actor has prior comic book movie experience with Daredevil, Dawn of Justice will by far be his biggest film to date. Affleck also implies that playing Batman may accelerate development on some of his personal directing projects. 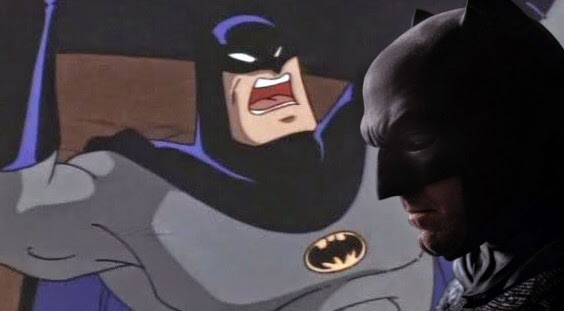 The acclaimed actor-director also reveals that one characteristic he shares with Batman is anger/rage, hinting at his take on the iconic character. “I think it’s a necessity, historically, in the tradition of these films. For me, anger is so deeply buried and contained that when it does kind of come out, it comes out in stronger bursts. I tend to be respectful, polite, get along, put up with, put up with, put up with … then, when it finally emerges, it’s not something I have a ton of control over. I’m not gonna go into a Wolverine berserker rage, but I do have a, I do…” Affleck then affirms that this is a personal trait that’s also a character flaw of his. In the coming weeks leading to the October 3rd release of Gone Girl, we will surely hear more from Affleck regarding Batman v Superman. Stay tuned for more news as we have it. Batman v. Superman: Dawn of Justice is scheduled to hit theaters March 25th, 2016. A follow-up to Man of Steel, the second installment in the DC Cinematic Universe stars Henry Cavill, Ben Affleck, Amy Adams, Gal Gadot, Jesse Eisenberg, Callan Mulvey, Tao Okamoto, Holly Hunter, Jeremy Irons, Diane Lane and Laurence Fishburne. Zack Snyder directs from a script by Chris Terrio and David S. Goyer.